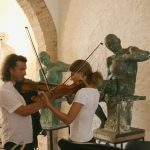 2 workshops are included in the Path “On holiday with your instrument”. This is the ideal space for togetherness in music, each with his/her voice. From Bach to Rap the choir unites joyfully the young musicians on the Campus. Everybody’s welcome: those with and those without musical skills, those who’ve never sung on a choir and those who study an instrument and wish to perfect their rhythmic, melodic and polyphonic skills. This is the time of day when all Campus participants gather and play music together. Each young musician, according to his or her skills, will contribute to a common project. Within the orchestra the hierarchy resembles that of a soccer team: each ‘player’ has a crucial role; each player is indispensable to achieve the ultimate result: staging the final show. It is therefore necessary to achieve a strong self-discipline to make coordination within the group possible: a self-discipline which is going to play a crucial role in the personal unfolding of each young musician. Ensemble music is highly educational for graduates and beginners alike. This is the type of music that creates close relationships and long-lasting friendships. Playing to the same score and “breathing in” the music together creates an empathy that makes it possible to convey emotions and feelings. Improvisation practice in search of the composer within us. This laboratory allows for the highest expression of creativity. Under the capable guidance of the Master the young person will be accompanied along an itinerary leading to the construction of a musical “shape”.